The Loft Stage » Auditions for Les Mis! New this year, we will audition for our fall musical, Les Miserables, the last week in August. If for some reason a student is unable to attend auditions due to summer conflicts, please contact director Kajsa Jones at kjones@theloftstage.org ASAP so we can arrange an alternative audition time. Auditions will take place Monday, August 27th and Tuesday, August 28th at 3:30pm in the Loft Stage. Students need only come to one of these two audition days – we encourage returning Lofties to audition on Monday if at all possible. 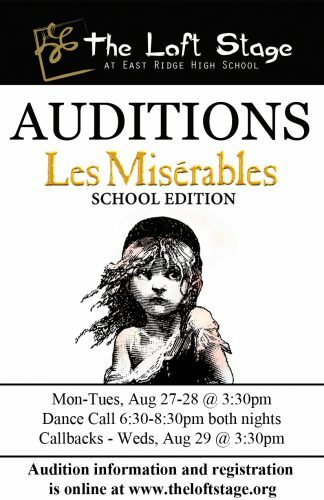 For the audition, students may prepare a song in the vocal styling of the show or learn a song (“Do You Hear the People Sing?”) from Les Mis at auditions. Sheet music for that selection is attached for perusal. Auditions will also include brief acting exercises and there a dance call, both Monday and Tuesday nights from 6:30-8:30pm. Pease wear comfortable clothing and footwear. Callbacks will be Wednesday, August 29th at 3:30pm in the choir room (rm. 1055). As students prepare for and consider the many dynamic roles this production has to offer, please do not feel limited by the age and/or gender of characters. The creative team is open to actor interpretations and risk-taking. Any additional questions regarding auditions can be sent to director Kajsa Jones (kjones@theloftstage.org) or assistant director Katie Carlson (kcarlson@theloftstage.org). CLICK HERE to view sheet music for auditions.